I've noticed a trend on social media for acting as if you are always happy, surrounded by good looking food, spending your holidays in gorgeous places, wearing only brands and opulent jewellery, and for my sanity I have to think that not everyone's life is this way. In no shape or form I would want that life, but I'm already out of their demographic. Scientists call this "living the best day" on social media, when people embellish their life and make it something that it isn't, in the process influencing others to aspire to that life and when they can't it leads to depression, anxiety and overall not trusting people. As I've "studied" (I'm embellishing myself, only wrote a paper about it for a class) this phenomenon, I've searched for genuine people on social media and to be honest I've kinda migrated towards Instagram in the memory of what was once Facebook. 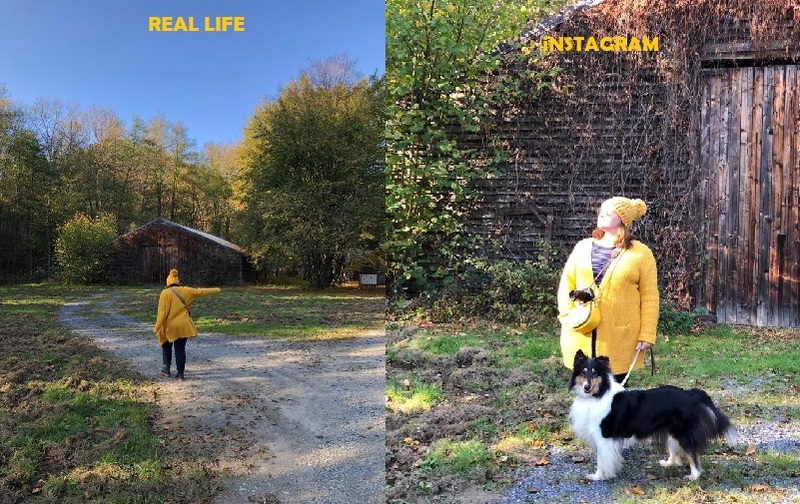 But being an Instagrammer lured me into this web of the perfect life, the perfect profile, of taking thousands of pictures and posting only 1, of studying my look, applying makeup :), searching for perfect locations to photograph and then I snapped. Now on my profile you see a copy of myself, of the mess that is life, of the things I love, places I travel and people I meet. I'm an expat and I chose to focus on the things expats do, instead of desperately trying to mingle with Luxembourgers. If it worked, I don't know, I'm still experimenting with my profile, I still do things "one should not do", posting wrong hashtags and not tagging profiles which I want to notice me, still using Instagram filters and not altering the photos I take with Facetune and (the horror) still taking pictures with my phone :D. I know the theory, I stay up with the trends, but on my profile I still want to be myself. Also trendy right now are the memes and you must have encounter the ones "Instagram vs. real life". The following pictures are memes wanna be. Enjoy! Guess each ones made it to my Instagram profile? Let's get down to business. It was my first time in Africa and although I do know that Morocco is not the entire Africa as much as Luxembourg is not the whole Europe, I might from time to time make this confusion. I do apologise. The first thing I've liked and I'm sure you will like too if you decide to take a trip to Morocco are the people. I've read that there are people who show you a path within the souk, you get lost and then they ask you for money to get you to a known place. I've read that the sellers pull you brutally into their shops. I've read that in Jemaa El Fnaa you will surely get pick-pocketed. All of those are untrue and very wrong. Every time we looked like we were lost (which rarely happens these days because GPS has made it to the souks) someone would jump to our rescue and reading all the guides, as stupid Europeans, the first times we brutally ignored the advice. We were wrong all the time. To the point when we started trusting the local people and they never led us wrong, they never asked for money and we never ended up in shops we did not want to enter. On the contrary, the shop owners were very informative, they explained all their goods to us even if we showed no intention of buying anything, every time I've asked for direction people would go out of their way to help and refused our money, nothing bad happened in Jemaa El Fnaa as much as nothing bad would happen to you going around Gëlle Fra in Luxembourg. So the people are the biggest resource of Morocco, I think. Seen from the plane, Morocco is a brown country, not a single patch of green, their fields look like what you would see in a demolition site in Europe and still these people managed to survive, to be good, helpful, to have a culture (and oh such a culture! ), to have customs, in essence to be good people, to be an example. Second, those amazing buildings. The riad where we've stayed, the museums, even some of the restaurants looked amazing. Such attention for detail! Such craftsmanship! Imagine combining on a single wall, sculpted wood, nicely coloured cast and tile mosaic without any dent, without anything hurting the eye. From what I've gathered, within the Medina (old town) people chose to richly decorate the interior of their houses, leaving the exterior in a shade of light pink which gave the name Pink City to Marrakech. As most of the museums, riads (B&B or small hotel build in an old traditional Moroccan house with courtyards or gardens) and restaurants within the Medina are in old houses, imagine the abundance of colours and architectural design! So although from the distance or even from within the Medina looks light, dirty pink, inside the houses a whole universe unravels. Third would be the food. Bare in mind that we spent two days inside our hotel room because of the food poisoning and I still say the food was great. I've eaten before tajine and couscous as there are a lot of Moroccan people in this region, but the dishes there have another taste. I'm usually not the person who likes weird combinations of sweet and sour, but the ginger chicken with figs was amazing! So much so that I've looked for and bought a cook book with Moroccan recipes, in French and even ventured to buy condiments from the spice market. Forth would be Marrakech as an ensemble. I believe that if you wanted to, you could stay awake for a week straight and do things day and night and never be bored. Coming from sleepy Luxembourg, it was a treat to always have something to do, see or admire. Still, although I thought I would make thousands upon thousands of pictures, I came home with only eight hundred. 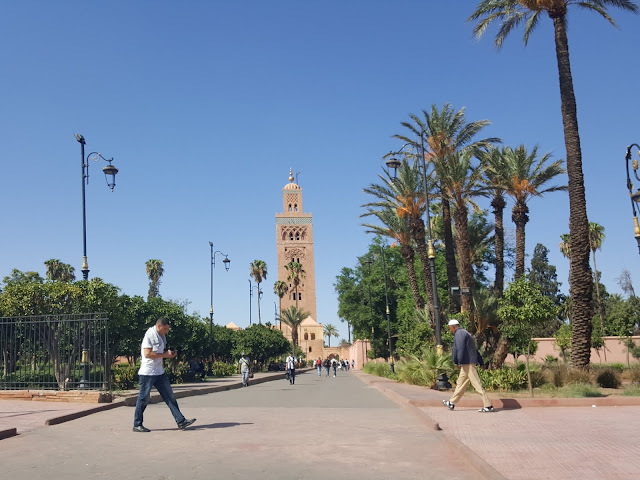 I believe that in this lifetime I will go back to Marrakech, so I will have time for pictures, but for now I wanted to experience everything and to talk to everyone. Do you believe that in Marrakech I was fluent in French? I even knew all the words and my husband says I even arranged them all in the right order within a phrase, thing that never, ever happened in Luxembourg as much as I wanted to talk with someone. Fifth, because it needs to be an odd number, are the crafts. Or should that be second? The carpets, the leather goods, the jewellery, the pottery, the raffia crafts, the argan oil, everything was hand made and everything was amazing! I wanted to take everything home and my shopping list got bigger and bigger each day. I did not like the haggling, but turns out that I was good at it when I wanted to. One can still find little treasures within the souk, but that someone should research a lot what they wanted to buy. I admit, I did not do my research, so I mostly chose by appearance and not the quality. There is one thing I did not like though, that Morocco is not in EU. My 24 euro top-up of my phone lasted me exactly 8 minutes of my mother describing the weather, my data left open for 10 minutes costs 40 euros, but every coffee shop and restaurant had WiFi, I've instructed everyone to not call me and the problem was solved.